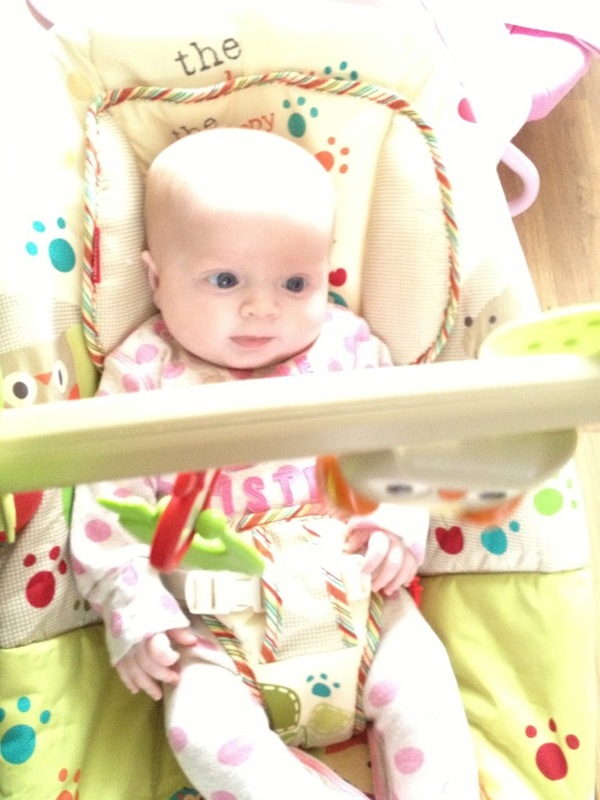 Having had two children prior to my new baby girl, I know that an essential piece of equipment is a bouncy chair. It’s great for the babies to have a bit of independence, some fun and give us parents a bit of a breather. A chance for a cuppa or to catch up on some housework, knowing that the baby is safe and happy. The Fisher Price Woodsy Friends Comfy Time Bouncer does the job. Aria was luck to be sent the Woodsy Friends Comfy Time Bouncer. This bouncy chair is very bouncy and super comfortable. The material is soft and it is well padded. I got it out of the box and had it built within 10 minutes. There were a few tricky screws but nothing I couldn’t sort. The harness is secure and I certainly don’t have to worry about baby girl falling out. There is a soft head rest which is nice for baby’s little head. You can see in the picture she looks comfortable and secure. There are some fun toys hanging from the toy bar above. One is an Owl which hoots and plays a tune when pulled and the other is an apple, there is also two removable toys one is an apple teething toy and the other is cherries that clicker together. 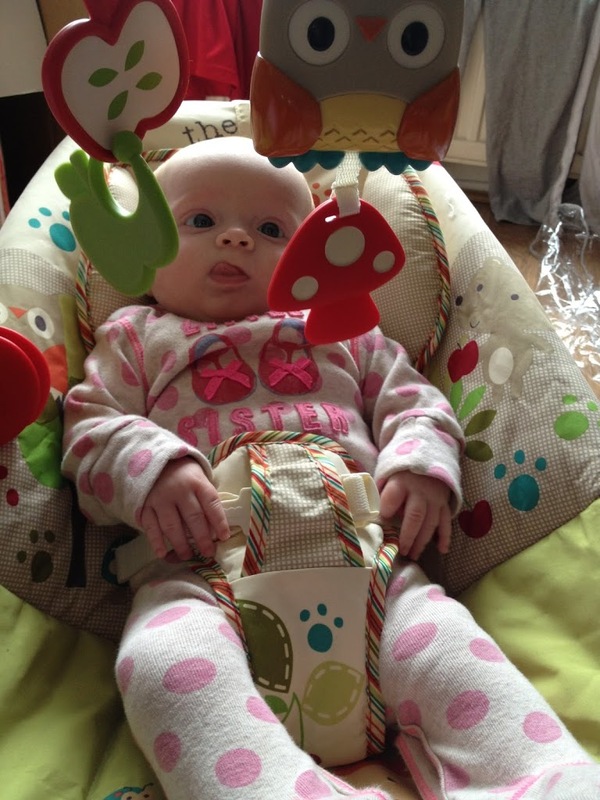 The toy bar is designed as a tree and fits in beautifully with the rest of the design of the bouncer. There are even some soft leaves for baby to touch and feel. It really is a beautifully designed bouncer. 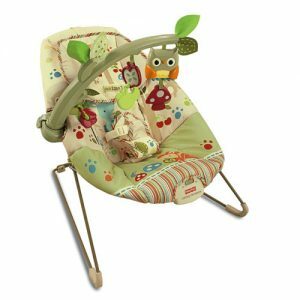 The only issue I found with it is that on my bouncer it takes a little bit of pulling to get the owl to play it’s tune. This seems to be mine, it seems to be getting a bit better over time. My best friend has the same bouncer and I asked her about it and she says her baby can get it to play a tune no problem. This doesn’t put me off it, it’s the comfiest bouncer chairs I’ve seen and the look and design has been well thought out. One of the best parts of the chair is the vibration mode, it’s calming and soothing. If Aria is having a grumpy moment, I can put her in the Fisher Price Woodsy Friends Comfy Time Bouncer and she is smiling again within five minutes. She hasn’t fallen asleep in it yet, but I’m sure it’s only a matter of time. It’s durable since my 4 year old climbed in for a shot. I can recommend this bouncy chair if you are looking for a comfortable, gorgeous looking and fun bouncer for your baby.